The start of a new semester is exciting! New classes begin, new teachers enter the scene, and students get to take on a brand-new set of subjects. For many kids, it’s a thrilling time of the year, buzzing with anticipation and excitement. But other kids take on a new semester with more caution, anxious and wary of the changes occurring around them. Regardless of how your child views the new semester, it’s an opportunity to start fresh and take on new challenges, and tutoring is a great way to help your student overcome those challenges and thrive in the months ahead. Everybody struggles with one subject or another, regardless of academic ability. It’s almost inevitable that your student will run into some sort of academic challenge in the weeks to come. Meanwhile, the B.C. Curriculum tends to snowball, with each lesson building on the one before it. If a student doesn’t understand the foundational material, it’s almost impossible for them to make sense of the topic when it builds into something larger and more complex. Compounding lesson plans become especially problematic in higher grade levels, where teachers only have a day or two to teach a lesson before they have to move the whole class forward. Once a child falls behind, they need to take on double-duty with their learning to catch up. First, they need to learn what they’ve missed and then they need to figure out the current subject material too. It’s an uphill battle from that point on. School plays a significant role in a student’s everyday life. Not only do they spend a good portion of their waking hours at school, but maintaining grades and getting along with peers is practically a full-time job. It’s easy for adults to forget how important school was to our sense of self while we were enrolled, but school is everything to many of the students who are working through it. When students struggle with any aspect of school, it can take a significant toll their confidence and sense of self-worth. In fact, students may beat themselves up for weeks before their suffering becomes evident on a report card or from a parent-teacher discussion. No child deserves that! Working with a tutor right from the beginning of a semester teaches students their own capacity for learning and overcoming obstacles of all shapes and sizes. 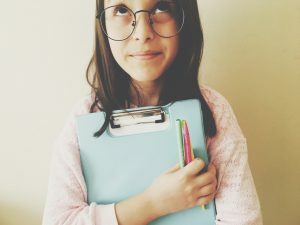 Students with tutors have a personal cheerleader who is ready to build them up and show them they can learn and understand anything their teacher throws their way. These students know they have the tools and ability to overcome academic challenges, which improves their confidence and builds self-esteem. Every single parent, from those with elementary aged children to those with high school aged children, share with our Academic Advisor at Tutoring…With A Twist that confidence is the number one reason they are seeking tutoring for their child. We all know that studying and reviewing material on a regular basis will improve academic performance, but far too many kids find ways to skip this critical part of development. We even go so far as to change the name we talk about homework with our families. We call it Own Work. This name gives kids a sense of responsibility and pride in completing this work. Tutoring helps students get into the habit of studying and investing in their own education. By normalizing studying, young learners recognize and accept it as part of their daily lives. Of course, tutoring shouldn’t take the place of personal studying; we find students are most successful when they devote time to homework (or “own work”) in between tutoring sessions. But tutoring encourages students to build up their own study habits and can help keep them accountable, as tutors check in regularly on how classwork is going. Tutoring is an amazing way to show children that you’re invested and committed to their success, even when you can’t personally help. Students who have a tutor all semester long feel supported and know their parents are willing to help them do their best. While young learners don’t always recognize or share their appreciation for your support via tutoring, it’s always there—especially when students see the benefits of tutoring in their own learning experiences. One of the key pieces of The Twist in Tutoring…With A Twist, is to ensure the children of all ages enter into tutoring with an understanding of the personal support they will receive. Even children that are unsure or clearly have stated that they don’t want tutoring, come out of our Initial Meeting understanding the amazing benefits of this personal support! If homework is one of the biggest sources of tension in your household, you’re not alone. We hear from many families who consider homework one of the most challenging and emotionally-charged part of the week. Parents and children alike can feel extremely frustrated when students are struggling to understand something, and that’s completely normal—but it doesn’t have to be your normal. Outsource difficult homework to a tutor and you’re likely to feel an extraordinary sense of relief. Instead of trying to battle your way through difficult subject matter, let a tutor pick up the reins. Not only are tutors able to fill in blanks of your knowledge (without your kids knowing! ), they’re professionally trained to help students work through difficult subject matter and the challenging emotions that result from it. It’s literally their job. Best of all, ending the homework battle means you can focus your parent-child relationship on building positive memories and experiences. Whether that’s cooking together, competing in board games, playing sports, or something else entirely, is 100% up to you! We have a H.O.M.E.W.O.R.K. Checklist that we would love to gift to your family that helps set your family up for success if this isn’t the right time for tutoring for your family.